You know those kinds of vacations you’ve thought about, pinned a thousand times, bought the guide books but just never pushed yourself to go? That basically summed up my thoughts on the trip I had always wanted to take through the French and Italian Riviera. I’ve had my eye set on these sights for years but life, other opportunities and feeling unsure of how to tackle the adventure always left me stumped. I’m thrilled to be putting our travel guide together for our trip and hope to offer some advice for anyone else curious to pay a visit. I’ll be breaking it up into two parts: France and Italy to save you a novel on our experience. 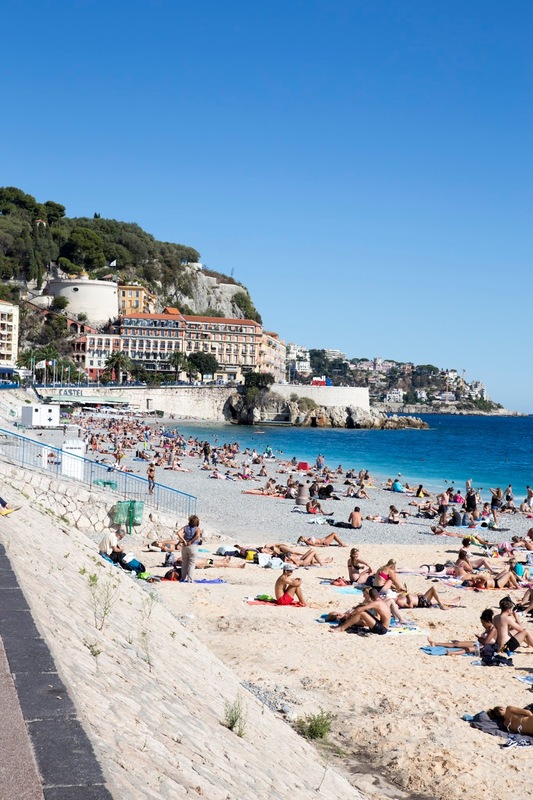 While there is a small airport located in Nice, the most economical options of getting into the heart of the Cote d’Azur from Toronto seemed to be flying into Marseille and making our way across the country. 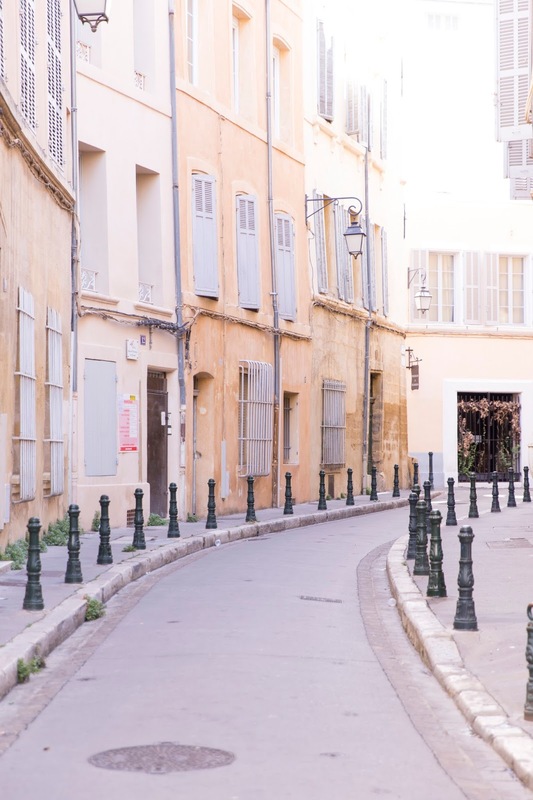 We also wanted to explore Aix for a few days and this was our best bet for making our way from one destination to the other. We rented a car for the entire duration of our stay and I couldn’t imagine navigating this vacation without one. I have heard that the train schedules are reliable and accommodating in terms of options, but we felt that a car rental was our best bet since we would be packing up and moving along the coast a few times. Do anticipate a wait getting your car rental sorted at the Marseille airport – service was slow and there seemed to be mass confusion sorting out everyone’s paper work. I actually found a great deal on our car rental by booking through the RyanAir website rather than your go-to booking websites. Tip: We were advised that an International Driver’s License was recommended for Italy (and France) but in hindsight, this likely wasn’t necessary so save yourself the $45. Do be sure to keep loose change on hand as there are various tolls on the highways. Some check points will accept credit cards but coins were easiest to manage. We decided that Nice served as the perfect home base for our trip. Knowing we wanted the option to visit local markets or even a grocery store, we felt an apartment rental would be best suited to the 8 nights we had planned. I found our apartment – Pastorelli – from an apartment rental website, Nice Pebbles. 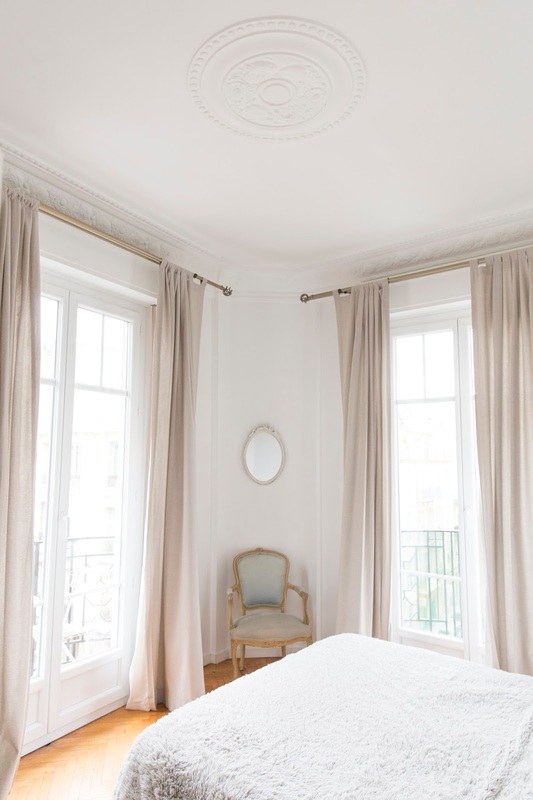 This is the first time we’ve rented an apartment in Europe and I must say, I think I’m a changed woman. Having the luxury of our own kitchen, laundry, a private balcony and elevator to ourselves – it was just what we needed for a relaxing vacation. 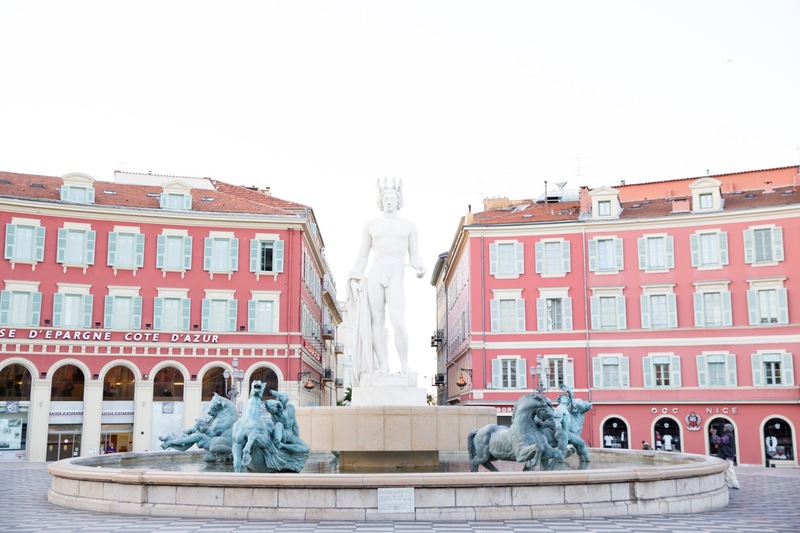 We were situated in the Old Town of Nice so anticipate an 8-10 minute walk to the beach but we found supermarket pricing to be more reasonable and our preference of restaurants was in the Old Town rather than close to the Promenade des Anglais. Parking was very reasonable on our street (1 EUR an hour from 8am-8pm) and only on 1-2 nights did we have to circle our block a few times to find a spot. 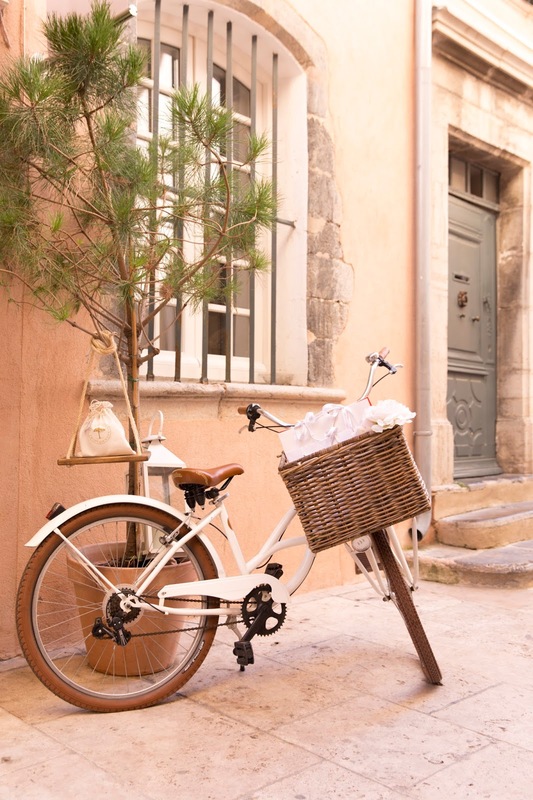 Located about 45 minutes from the Marseilles airport, I highly recommend a stay here for a night or two if you’re interested in getting a taste of Provence. 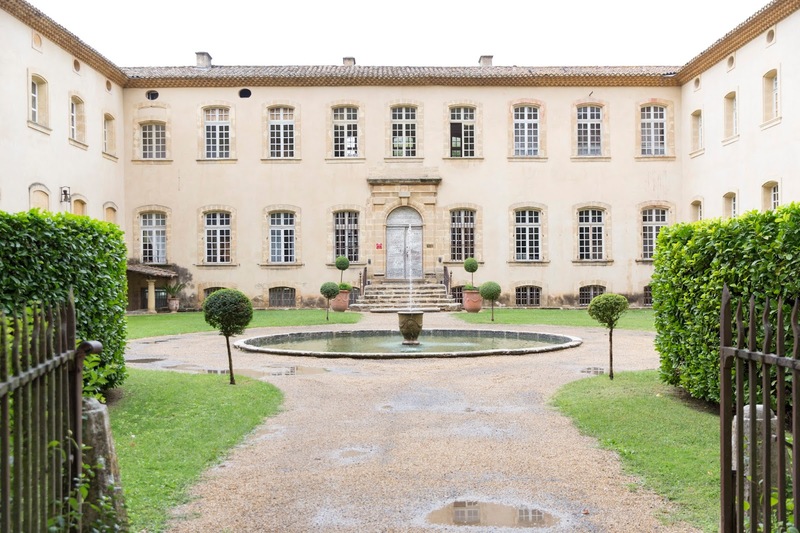 We stayed at the Chateau de la Pioline for a night’s stay while exploring the area. 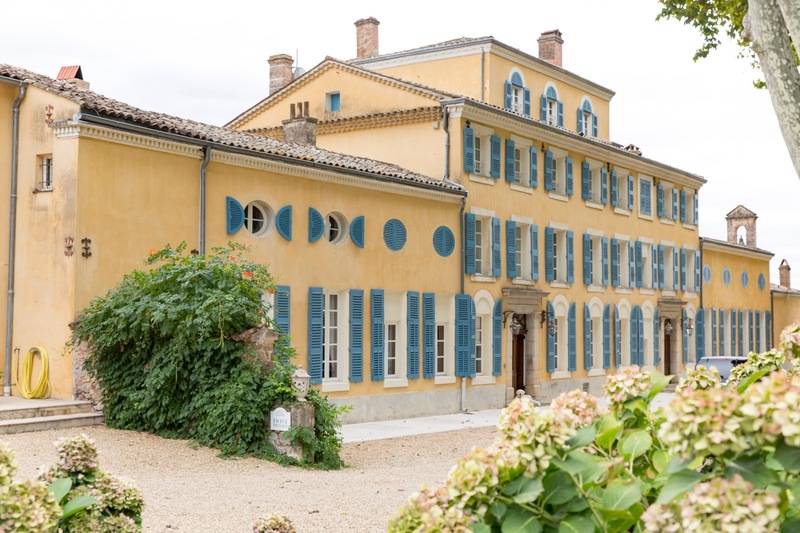 It may appear to lack charm because of its proximity to the commercial area of the city but beyond the gates, it’s a charming chateau and the grounds are absolutely stunning. We were about a 10 minute drive from the city center and found parking to be easier than anticipated. We spent our Saturday strolling around village stopping for lunch at Bunny’s for a quick bite. For supper, we dined at Le Zinc d’Hugo which featured an impressive wine list and cozy eats. 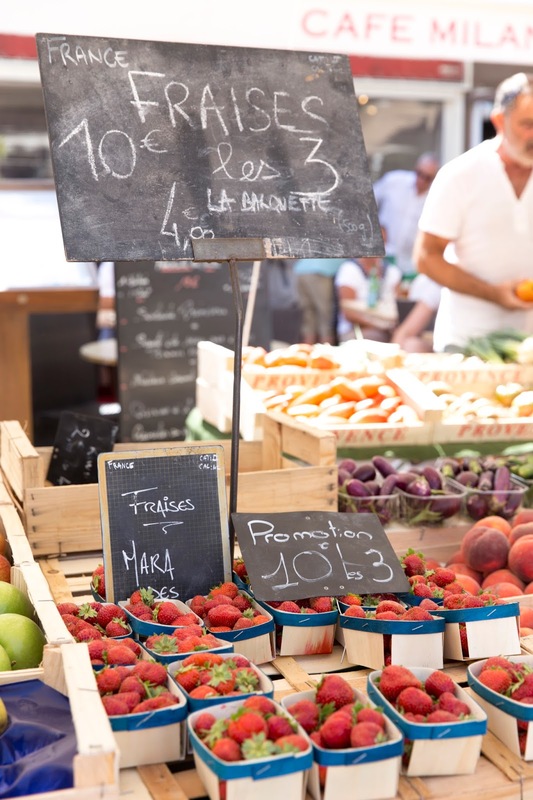 We spent our Sunday morning perusing the local market (Place Richelme)– a must do in the area! We picked up a baguette, cheese, fresh fruit and a few other nibbles as we had a drive ahead of us for the afternoon. 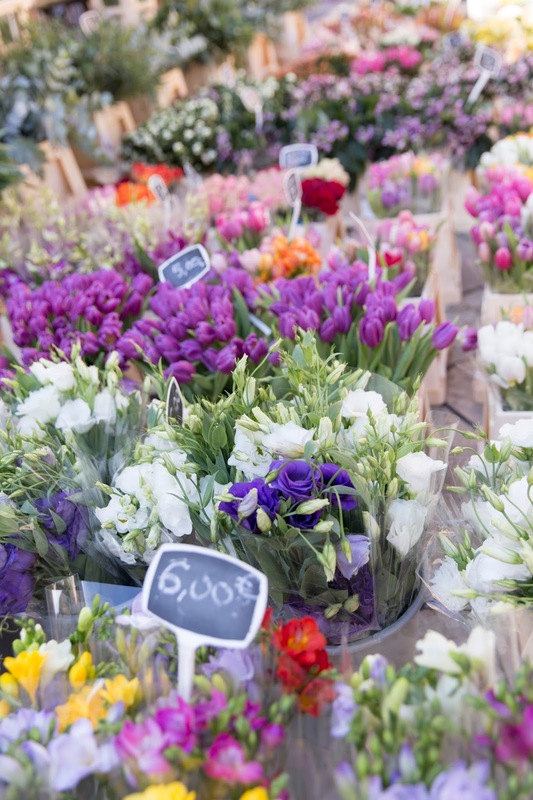 The fresh flower market is also an Instagram worthy sight! 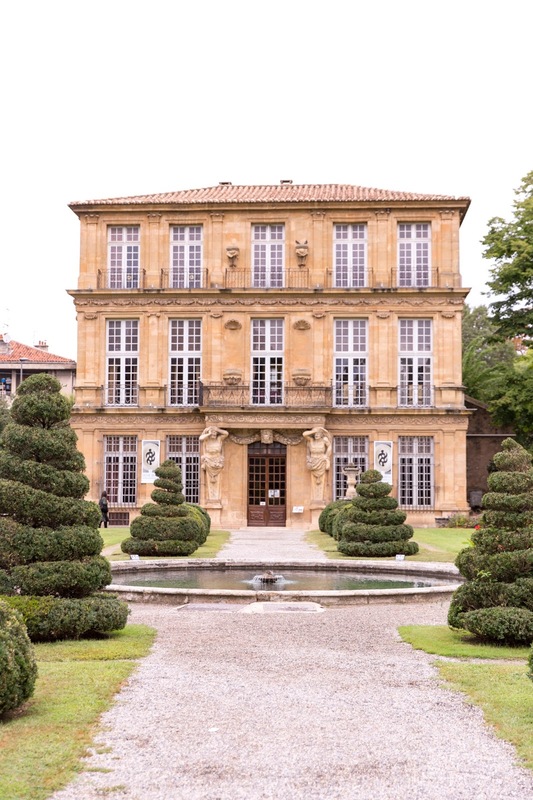 When planning the trip, I couldn’t help but notice that our drive from Aix to Nice was parallel with the wine country in Provence including my favourite – Chateau d’Esclans (home of Whispering Angel and Rock Angel). We booked a complimentary tour and tasting and I highly recommend! If you have time, other wineries recommend in the area was Domaine du Jas and Domaine des Grand Esclans. Despite being closed when we arrived, lunch was recommended by the staff from the winery at La Maurette down the road. We stopped in and it certainly looked charming and filled with locals. Arriving in Nice a little tired, we visited the local market (one street behind the Promenade des Anglais) for some refrigerator essentials, strolled the Promenade at sunset and picked up wine and cheese at our local grocery store for the week ahead. For supper, we dined at La P’tite Cocotte. 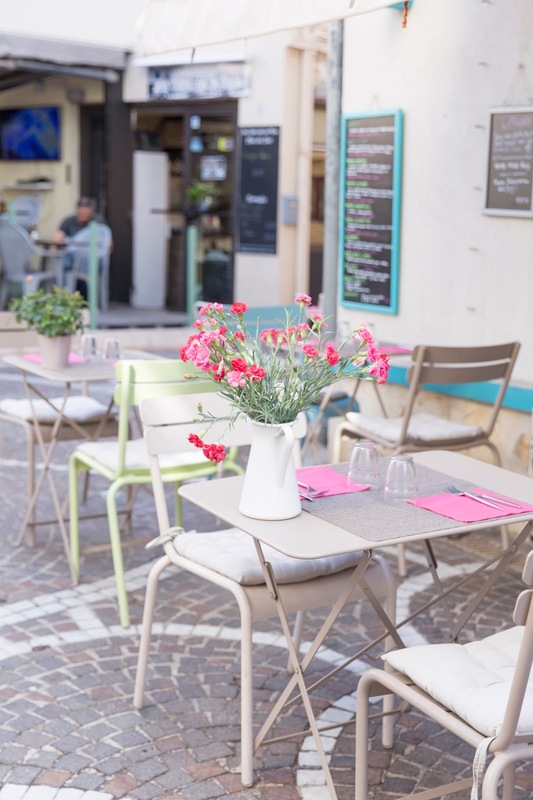 The food was great but the service was quite slow – even for restaurants in France ;) Do expect a slower restaurant experience than in North America but know it’s for the best so you can enjoy each course, your wine and soak up the people watching! We also suggest making reservations at least 2-3 nights in advance to ensure you get a table. We spent our first full day in the French Riviera in Nice as we were a little tired from the drive and looking to soak up our local sights. We grabbed fresh croissants from J. Multari bakery and headed to the beach for a day in the sun. 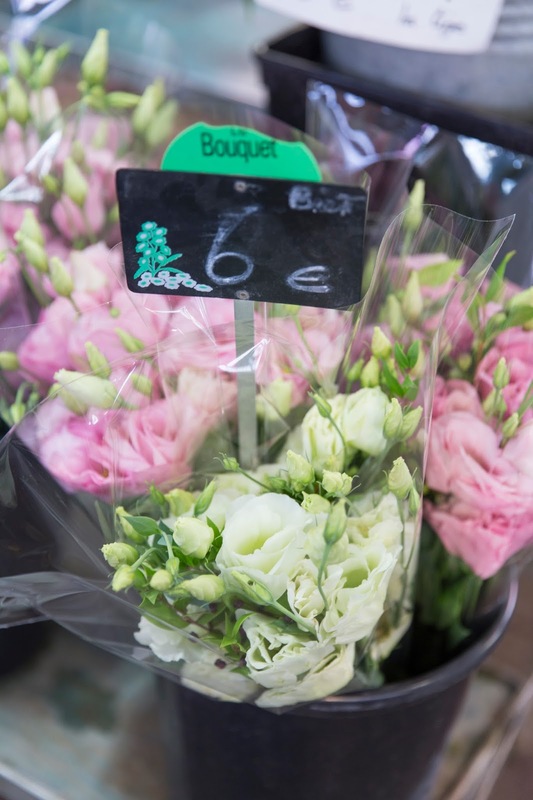 We typically packed our own lunch for the day or would grab fresh sandwiches from Boulangerie Blanc and then visit a local convenience store for bottled water, wine or beers. I do suggest spending a day strolling around the area. 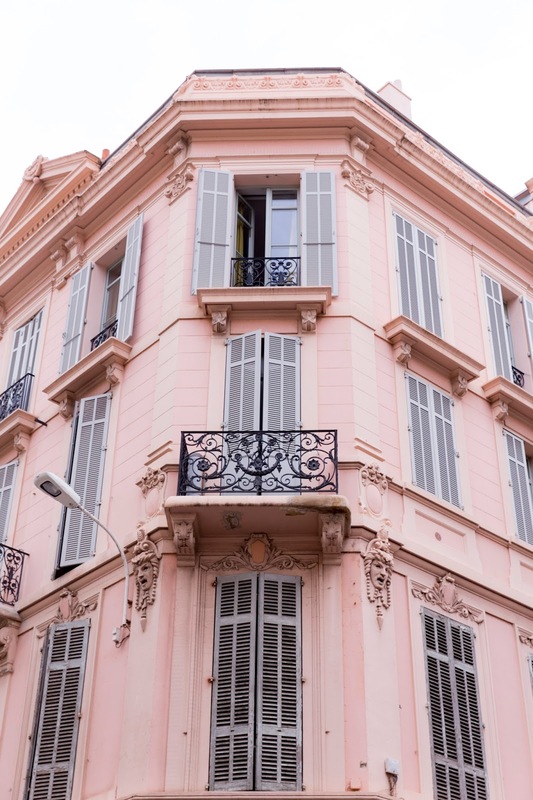 Start at Place Messena and walk your way up to Promenade des Anglais to get yourself familiar with the area. I then suggest making your way up to Castle Hill for sweeping views of the city - particularly before sunset! To be honest, our favourite part was getting lost in Old Town for an evening stroll. Expect to get lost in the winding roads but it makes for a fun experience! While there is a small patch of sand on the main beach in Nice, expect pebbles. While I’m not a fan of water shoes, comfy espadrilles seemed to do the trick. Our apartment came with beach chairs and towels so we hung out with the locals but expect to pay around 40-60 EUR for 2 chars at the beach. Looking to change things up cuisine wise, we dined at Acchiardo (Mediterranean inspired fare) for the evening. There were still local influences including chickpea-flour pancakes but their pasta dishes were delightful. The price was also VERY reasonable compared to many other local restaurants – highly recommend. Following dinner, we strolled around town and grabbed gelato at the famous Fennochio’s – another must do! We had knew the drive to St. Tropez from Nice would be our farthest destination as far as day trips so we opted to do this sooner than later. We left around 8:30 AM to beat the traffic rush and didn’t arrive until 11:30 AM. With only 1 road going in and out of the city, anticipate delays. We looked into ferry and train options as well but driving the car was still our best and most economical option. 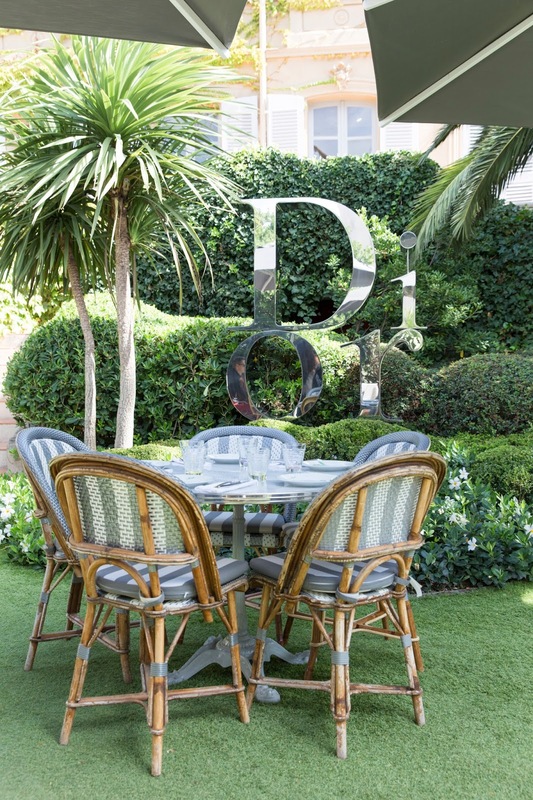 You must, must, must dine at the Dior café, Dior Des Lices, in St. Tropez for a fashionable experience like no other. Expect higher fares on your bill but the meal size and the food lived up the expectation one would hope. 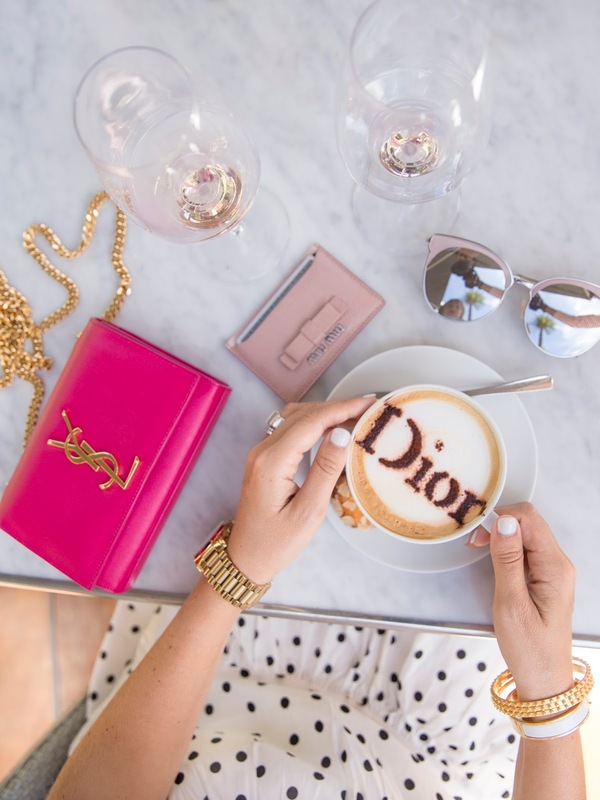 And at the end of your meal, a cappuccino is necessary for some Instagram worthy coffee art. Do book reservations 2-3 weeks in advance to be safe! 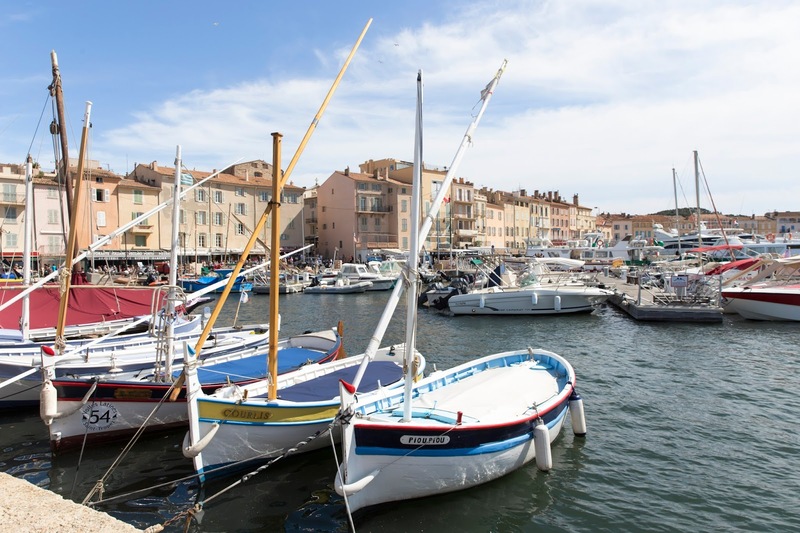 What we didn’t know was that the beach of St. Tropez and the shops/marina/restaurant of the city are in 2 very different areas. Having spent 3 hours in the car, we decided that strolling the city for the day would suffice. If you do opt for the beach, Club 55 is the place to see and be seen. 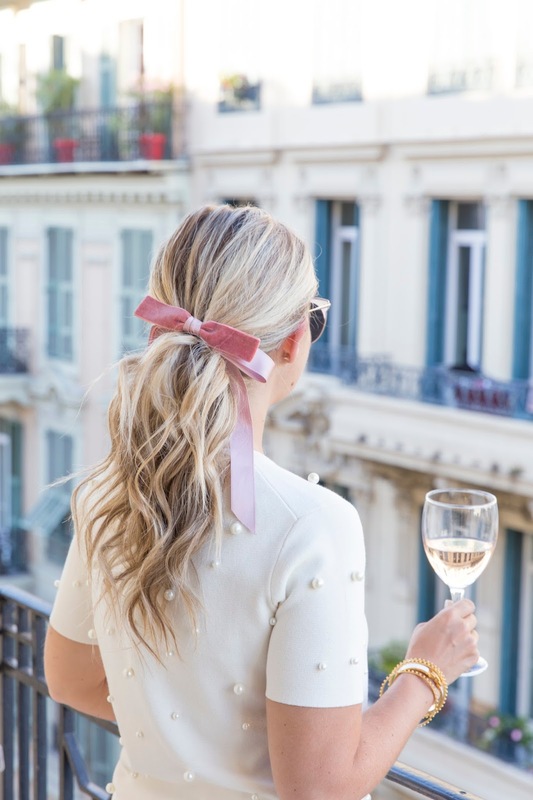 We stopped into boutiques including Les Senteurs Tropezienne for candles, perused the boats in the port, enjoyed sunset cocktails at Restaurant L’Escale and sweet treats at L’aduree. We made dinner reservations on a whim to Restaurant Le G’envie. Our meal was in our opinion, one of top meals we had on our entire trip. For sunset drinks, also consider Senequier for its people watching. Bakeries worth noting were La Tarte Tropezienne and Grand Marnier Creperie. Another restaurant on our list, but we never made it, was Clandestino. 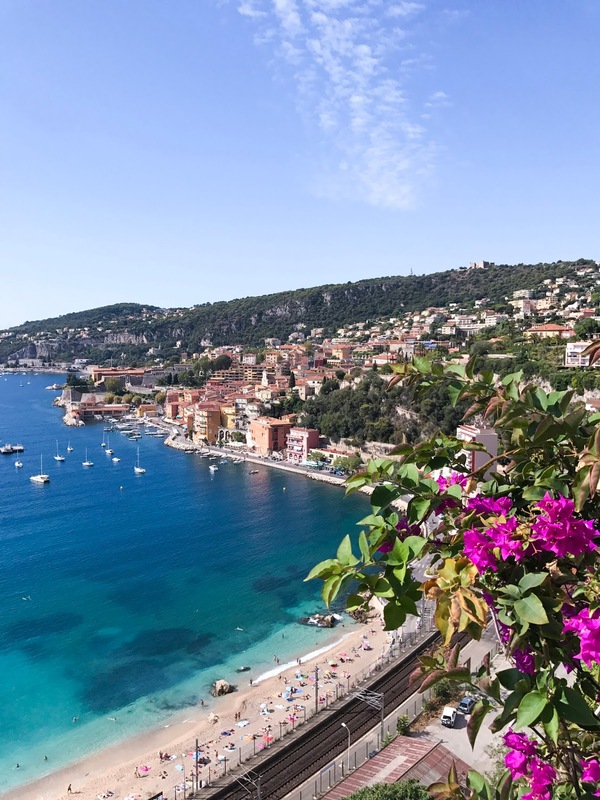 Looking for a city closer to our apartment, we decided that VilleFranche-sur-Mer would be an ideal destination being only 20 minutes away. If you are driving, be sure to take the scenic route that runs along the water for some insane views. 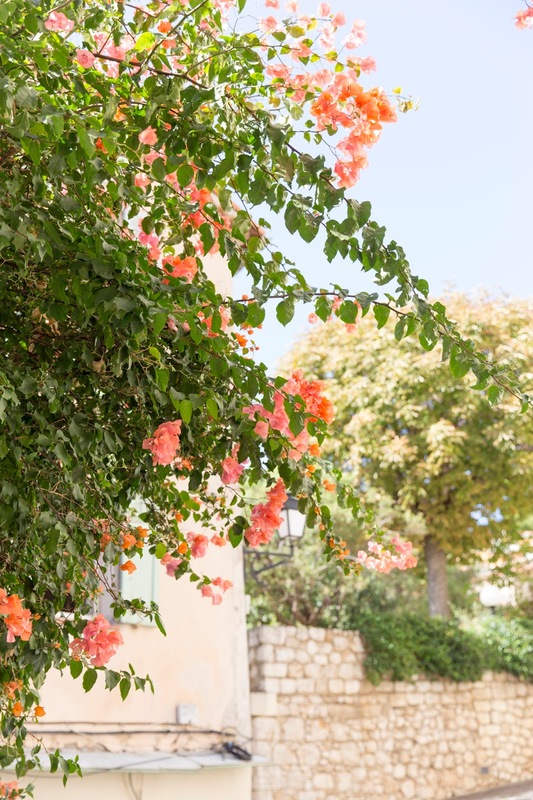 The town of VilleFranche is incredibly charming, colourful and had some of the bluest waters we’d seen along the coast. We will most certainly be coming back to this town when we return – it was one of our favourites! After exploring the city for a few hours, we decided to set up camp on the beach and enjoyed fresh sandwiches from a local shop (The Good Mood Cafe). There were also plenty of restaurants with patio dining on the waterfront nearby with great seafood and salad options like La Mere Germaine. If a cruise is in port that day, expect a busier crowd but otherwise; the area is quite calm and quiet compared to others. 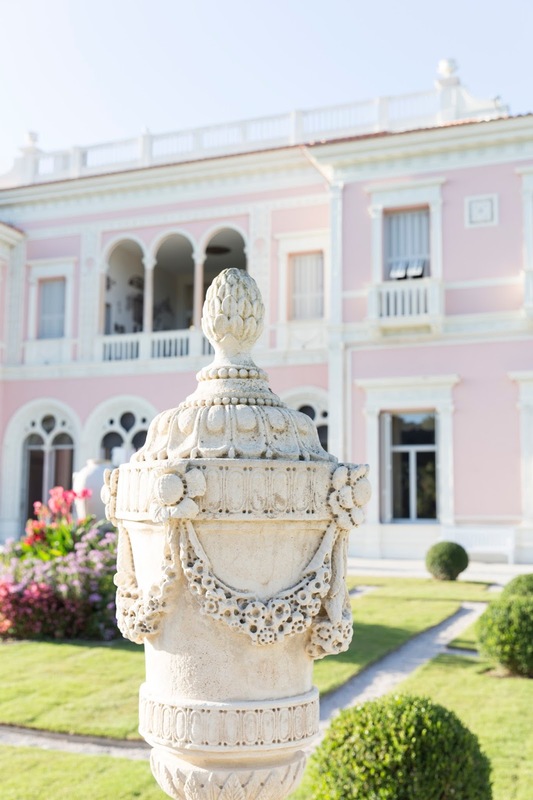 Around 3PM, we decided to head into Saint Jean Cap-Ferrat and visit the Villa & Jardins Ephrussi de Rothschild. 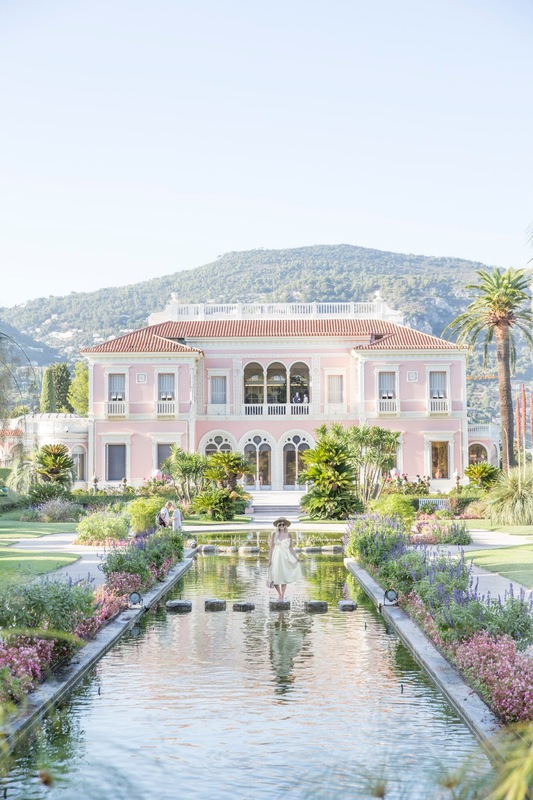 A pink palace surrounded by lush gardens, this is a must-do! The water fountain show is featured every 20 minutes and is definitely worth a viewing. We dined at La Cuisine that evening in VilleFranche and the meal was superb. With the menu changing daily, it's hard to suggest a dish but do try to get a seat outside for the people watching! Day 6 – CannesA little foggy and overcast, we figured our day in Cannes would be more of a sightseeing day and our excuse to shop. With any and every designer you can think of spanning the main promenade, it almost feels like a crime not to! I will be honest, I had higher expectations for the town and perhaps it was the weather but it just lacked the charm we seemed to feel from the other cities we had visited. I do recommend the area if you’re looking for a shopping day, people watching along Boulevard de la Croisette and great meals but by 3-4PM, we were more than happy to head back to Nice and spend ‘apero’ (happy hour) on our balcony with a 4 EUR bottle of rose, cheese and a fresh baguette. We did manage to squeeze in a lunch in Cannes at L’epicurieux for some great salads and a side order of frites. For dinner that evening (back in Nice), we scored a table at Les Garcons and I would HIGHLY recommend a visit here. Their burger was to die for as well as the duck! 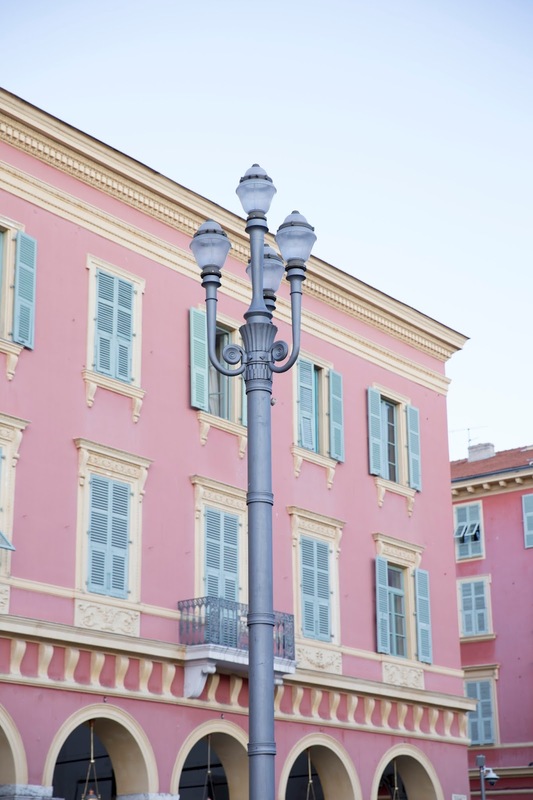 Day 7 – Monaco and Menton A must-see for Adam on this trip was a visit to Monaco (cough cough James Bond fan). With the drive being about 25 minutes away from Nice it was another perfect day trip. 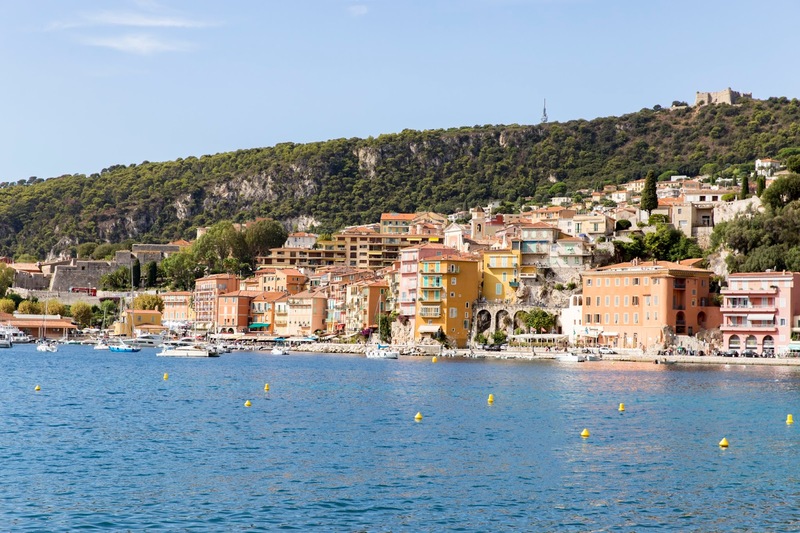 I can’t seem to locate the official name of the highway, but try to avoid the inland route and opt for the scenic drive along the water that will take you through VilleFranche once again (and prepare for few stops along the way for photos!). I do recommend a coffee break in the café located in the Monte Carlo casino – the setting is adorable. Friends recommended lunch at Cafe de Paris but to be honest, the prices seemed a tad astronomical for a small salad or even a sandwich so opted out. Must-do spots for cocktails are Bar Americain and The Crystal Bar. The people watching is worth the price tag however, I wouldn’t anticipate spending more than half a day in Monaco (unless you plan on visiting and playing in the casino) so I would recommend tacking on another nearby city to see. 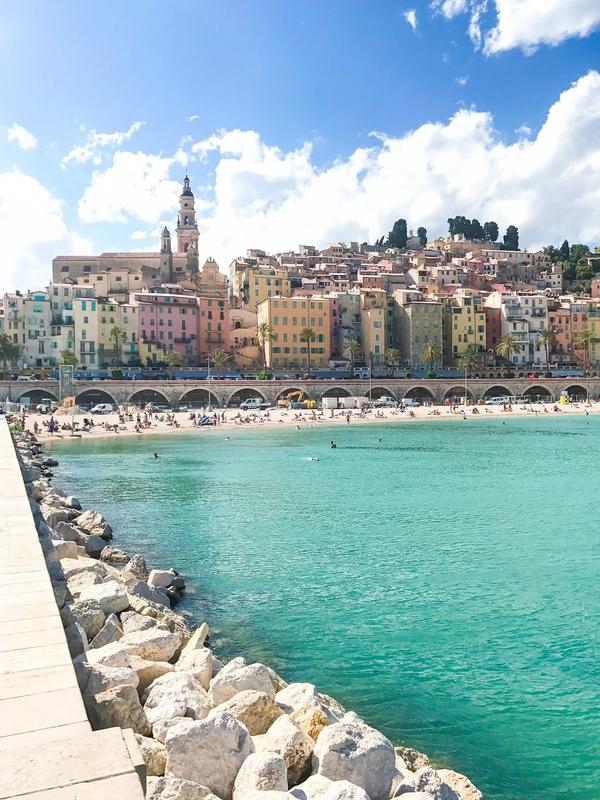 After visiting the casino, strolling the square and the Palace, we decided to make our way over Menton for the afternoon. We found this to be more our pace and much more charming. Plan for a dip in the water – its crystal blue and not as busy as some of the other beaches we had visited. 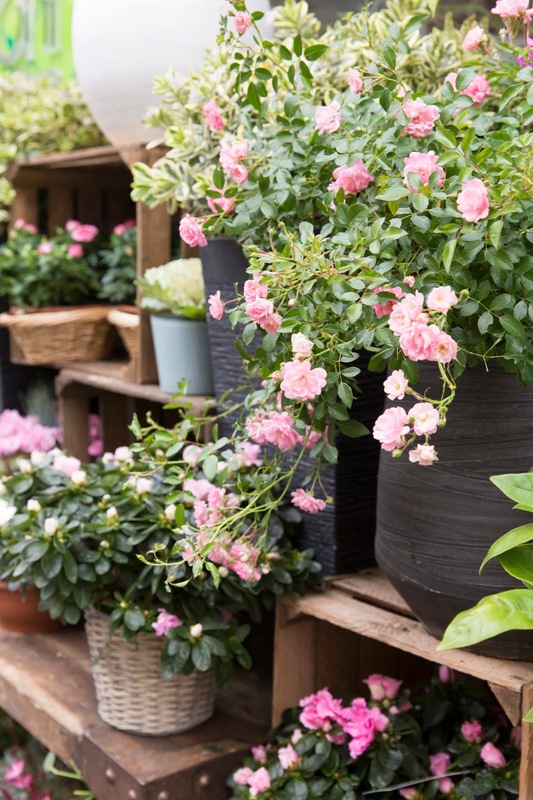 Following that, be sure to head into town for a lemonade, olive oil tasting or even pick up a wicker basket! That night, we dined at Les Garcons in VilleFranche (different restaurant, same name!) on our drive back home. We both agree this may have been our favourite meal throughout our entire trip. The al fresco setting is stunning, wine list was great, meal was amazing and if they have it – order the caramelized marshmallow dessert! I think it’s possible that we saved the best for last when it came to Antibes. Aside from locating Hotel du Cap and Billionaire’s Row, I couldn’t seem to find much else on the area of interest but was curious to see the town. Upon arriving, we strolled through the marina (worth a visit! ), located the cutest café - Café Clemenceau – and casually perused through some of the local boutiques. 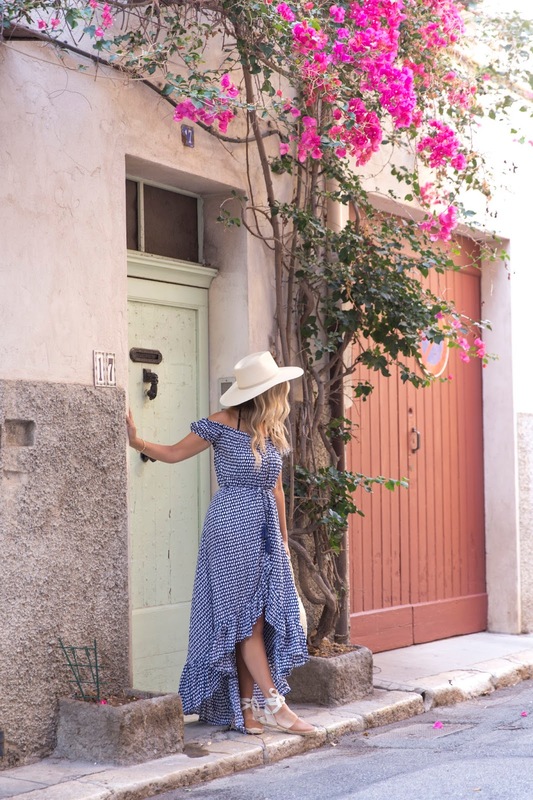 I actually did most of my shopping in Antibes finding great tapenades, sea salt, straw bags and woven sandals. At the end of a street, we turned the corner to find their bustling market on a Saturday morning. We picked up fresh strawberries, cheese, honey and more. Out of all the markets we had visited, I think this one had to have been my favourite. With a few hours to spare, we headed to the beach (Plage de la Gravette) and soaked up the sun. A nearby pizza shop, Gusto Antibes, had great slices to go and the price was quite reasonable. Around 5PM we strolled around the marina one last time and headed back home. I know, I know we missed out on Hotel Du Cap but after reading that 2 chairs by the pool would run us about 80 EUR+ (don’t quote me on that price), we figured we’d be just as content sitting on the beach and getting to experience the town the way locals would. This is a city we will definitely be back to see. Growing tired of uber rich foods, we opted for dinner at La Rossettisserie in Nice that evening for an amazing experience. At around 15 EUR per person, we each got a half chicken, grilled vegetables and mashed potatoes that rocked our world. Be sure to ask for a table underground in the cave! For our last day in the area, we figured it was best spend in Nice to relax before our next destination. Sunday is the flower market day in town so we grabbed a coffee and hit the market. We splurged and spent the day at Ruhl Plage on the Promenade. 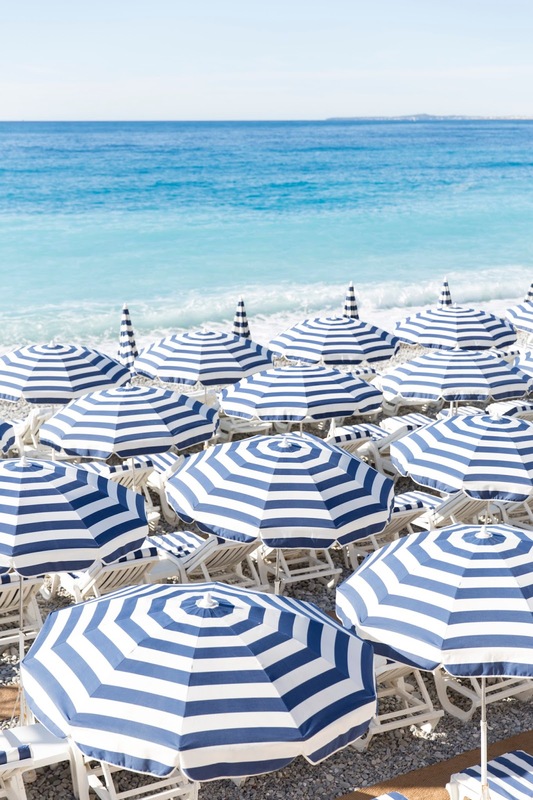 I highly recommend getting up early and watching the sunrise from this spot – it’s also the best time to get that quintessential shot of the blue and white umbrellas perfectly set up before the crowds take over. Lunch is delightful at this spot but also consider a Sunday morning brunch for only 15EUR per person. For our last meal, we dined at Olive et Artichaut. Erring on the rustic side of French Food, the scene was quaint and the food was amazing. It was the perfect sendoff from our amazing stay in the area. SO....will we be going back? Absolutely. In fact, we’ve even been trying to solicit friends to rent the same apartment next year so we can share our experience with others. From the people to the food and culture, it was definitely a memorable trip that lived up to the hype. Restaurants we missed out on Nice but you must visit: Chez Palmyre, Oliviera and Comptoir Des Marches, Citrus and La Roustide. Love Love Love each and every detail ! If you don't mind me asking , what advise will you give on a ballpark budget for a couple as per your itinerary ? We are not big on fancy meals nor do we drink. Looking ahead to your reply. Thanks for your comment. I would say it's safe to budget from 50-80 EUR a day for food assuming you're eating out for lunch and dinner (we made our own coffee and bought $1 EUR croissants for breakfast). For accommodations, airfare, misc. fees and gas, I'd say 3-4K to err on the safe side.